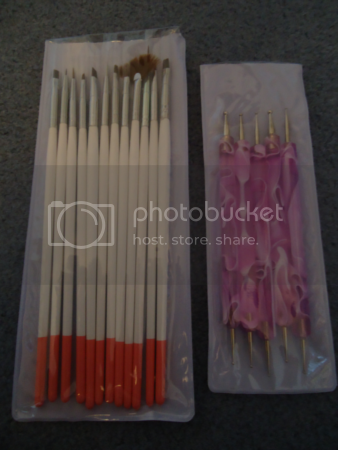 I bought some nail art brushes and dotting tools on Amazon the other day. I'm really excited to try them out, because before now I've had to improvise with hair pins and things like that, with mixed results. I don't remember exactly how much I paid for them, but they were pretty inexpensive. My only question is what on earth does one use the fan brush for?! "Say hello to my little friend..."